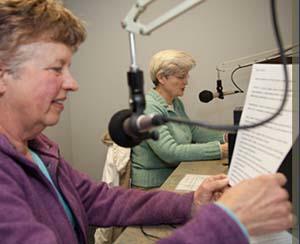 The Augustana Public Radio Information Service (APRIS) provides free readings of local and regional newspapers for the visually and physically impaired. Every week, some 200 local volunteers read from the Quad-City Times, Moline Dispatch, Rock Island Argus, Clinton Herald, Chicago Tribune and more. APRIS is operated free-of-charge as a side-band radio broadcast of WVIK 90.3 FM from Augustana College in Rock Island, IL. The APRIS service is made possible by support from UnityPoint Health - Trinity. Anyone with a physical disability making it difficult to read or hold a newspaper is qualified for the free APRIS service. Those living within 45 miles of the Quad City area can receive the signal. Outside the WVIK listening area, you should contact the radio reading service in your area, either through your local public radio station or local library. The APRIS program, a unique service offered by WVIK with assistance from the Illinois State Library and other local funders, serves 1300 clients annually. We boast a volunteer pool of nearly 200, contributing a combined 4500 hours each year to the preparation and reading of the local newspapers over the air to those with a special radio. Although we can get a lot of the content found in the local newspapers through other media outlets, critical news information - the information that connects us to our community is missing from radio and television. Our most popular programming includes the obituaries, news of neighbors, grocery ads, and local columnists like Don Wooten or Bill Wundrum. APRIS offers free access to all of this content. And the need for this service is ever growing. According to the National Federation for the Blind, roughly 3% of the population is visually impaired. In our listening area, this could be more than 20,000 individuals. The APRIS service is made possible by support from UnityPoint - Trinity. How can I get a receiver? Receivers are loaned free-of-charge to all who qualify. If you no longer require or want the service, simply return the receiver to WVIK. A tag on each radio tells who to call for repairs or replacement. Yes! If you have some volunteer time to give, we would appreciate your help. Volunteering for APRIS is a rewarding experience that requires very little of your time to provide a useful service for those in need. Call (309) 794-7560 or email Pete Peterson. We can schedule a time for training and sign you up either as a substitute or on a regular schedule. How else can I support APRIS? When you make a contribution of financial support to WVIK, your dollars help make WVIK and APRIS programming possible. Call us at (309) 794-7507 or make your pledge online.